Hockey season is winding down, with all eyes looking toward the impending playoffs. In true Canadian fashion, Drake had his sights set on last night's NHL's going-ons, perhaps hoping his beloved Maple Leafs can regain some of their mid-season swagger. Yet it was something different altogether that caught his attention. Game Of Thrones star Sophie Turner, who fans may recognize as Sansa Stark, was in attendance during a game between the New York Rangers and the Detroit Red Wings. Upon being caught on the jumbotron, Sophie seized the moment, opting for the boss-like combination of dabbing and bodying a glass of red wine. "Send it for the starks," captions Turner, tagging the New York Rangers for good measure. While the clip in itself amusing to behold, it appears to have made an impression on Drake, who slid into the comment section to praise Turner's antics. 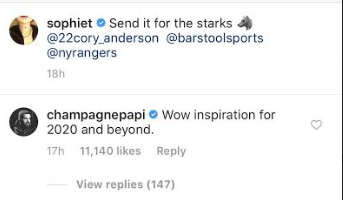 "Wow inspiration for 2020 and beyond," writes Champagne Papi, confirming his loyalty to Game Of Thrones' northernmost house of prominence. Appropriate, given his own oft-cited Raptor's moniker. Where the NHL fans at?